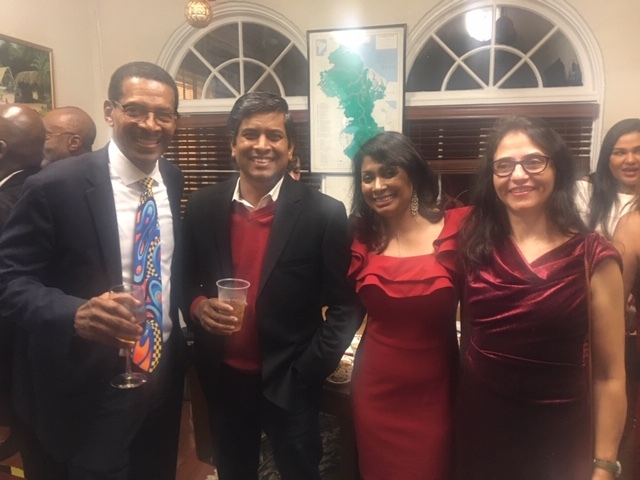 ​The traditional annual Christmas Get-together of Guyanese at the Guyana Embassy in Washington DC, brought together Guyanese of every background, as they mingled together the way Guyanese do at most fetes. Some of those who were in attendance have not been home for many years, while there are those who visit regularly. 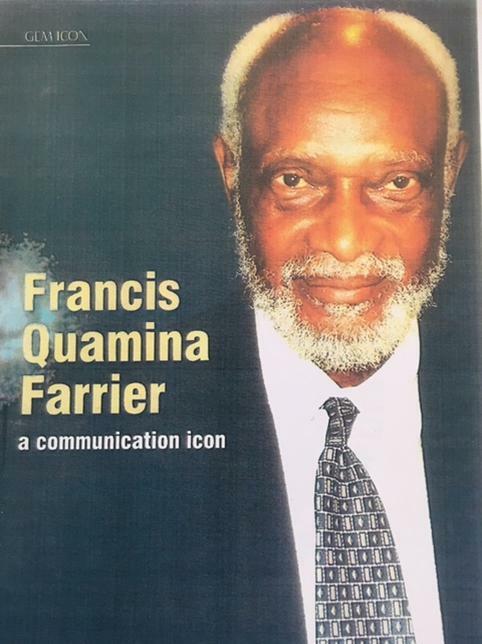 As such, there were lots of discourses about the developments taking place across the ten Regions of Beautiful Guyana, including the recent announced discovery of Oil and Gas within Guyana’s Atlantic Sovereign territory. 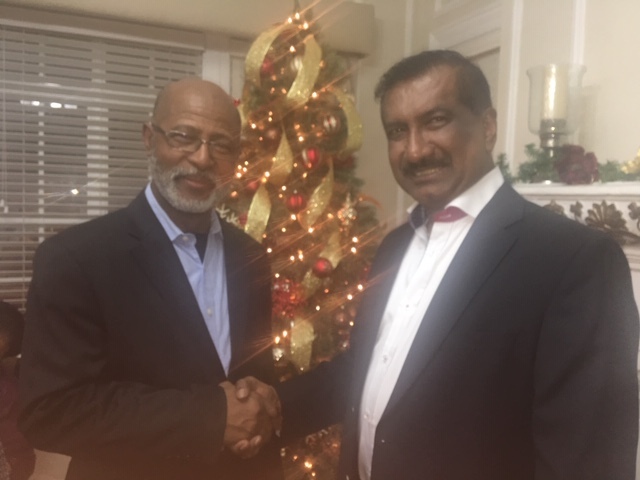 However, much of what was in evidence, was the comradery of Guyanese of many backgrounds and professions, and the way in which the Christmas spirit, as known in Guyana, was in evidence. There was the live music dishing out lots of Guyanese favourites, including the popular folk songs which we all love. There was of course, the dancing, and the eating and drinking. The cuisine was very much Guyanese, including our popular Indigenous National dish, Pepperpot. 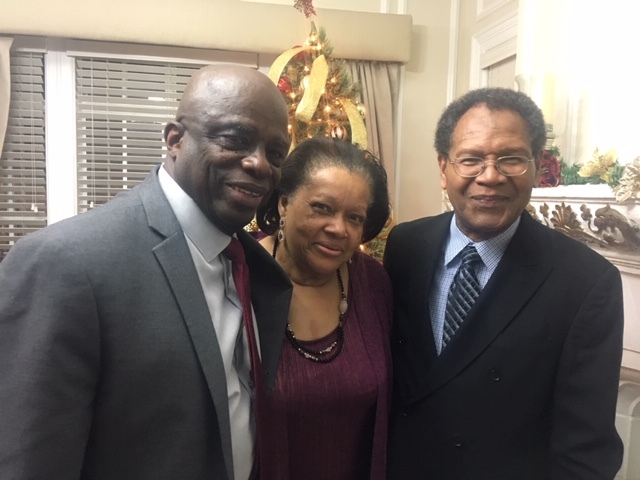 Most of what was enjoyed was sponsored by Guyanese individuals and companies; the principal being Aubrey Stephenson, AA, the President and CEO of Federal Management Systems, Inc.
Gracing the Yuletide event with their presence were recently retired American Ambassador to Guyana, Perry Holloway and his wife, who seemed as Guyanese as any non-Guyanese could be. 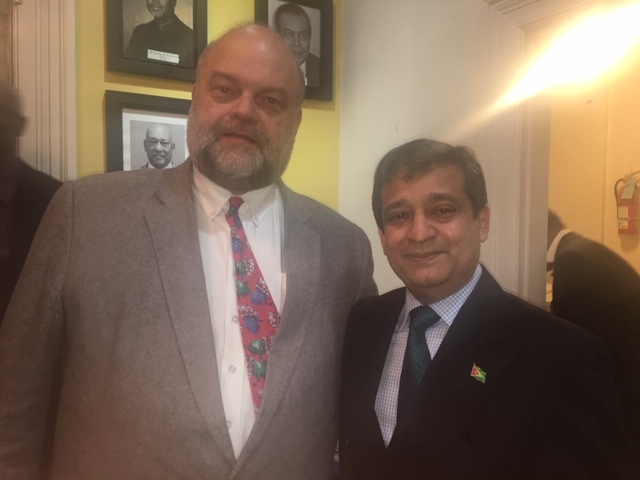 Before he left, I took the opportunity to pose a question to the tough-looking diplomat; “What has been your most memorable adventure in Guyana?”, I asked. 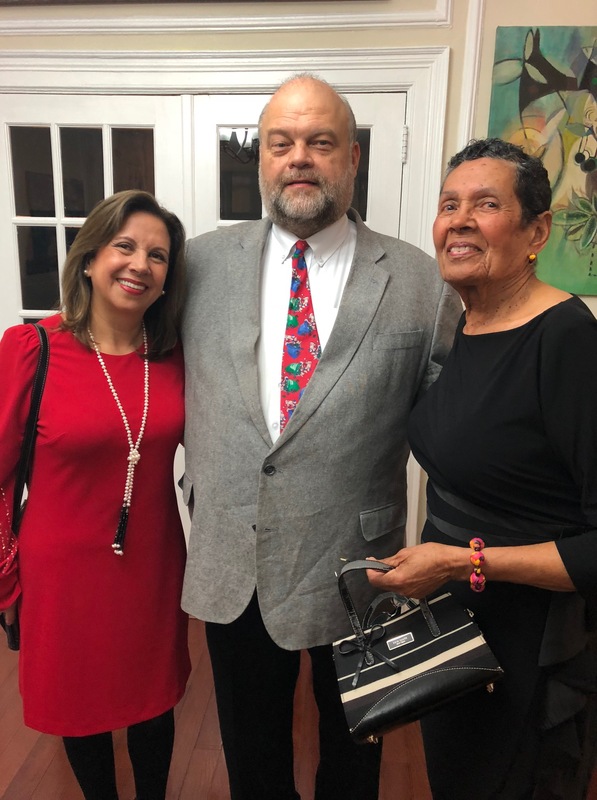 “An overland trip from Georgetown to Lethem”, was his response.” As those who have made that trip in more recent times, it is known that the trail is not the easiest one to traverse, but Ambassador Perry Holloway has listed it as an adventure he will always remember with joy. Not at the event at the Embassy, Georgetown-Born and a founding member of the Guyana Defense Force, Pennsylvania, USA-based Clairmont A. Griffith was invited via email to reminisce on Christmas in Georgetown, back in the day; “Christmas remains my Favourite Holiday Season”, he responded and explained his experiences when he was a young boy growing up in British Guiana. “I fondly remember Christmas Window Shopping with my parents, two sisters and two brothers at the big Department Stores on Water Street – Bettencourts, Fogarty’s, Sandbatch Parker and Bookers Universal, and at T. Geddes Grant on Main Street.” For the Griffith Family and so many others, “The evening shopping in front of the Stabroek Market where many parents purchased imported FRUITS and NUTS from the vendors that lined the pavement”, he concluded. And from me to you, do have a Peaceful and HAPPY CHRISTMAS. 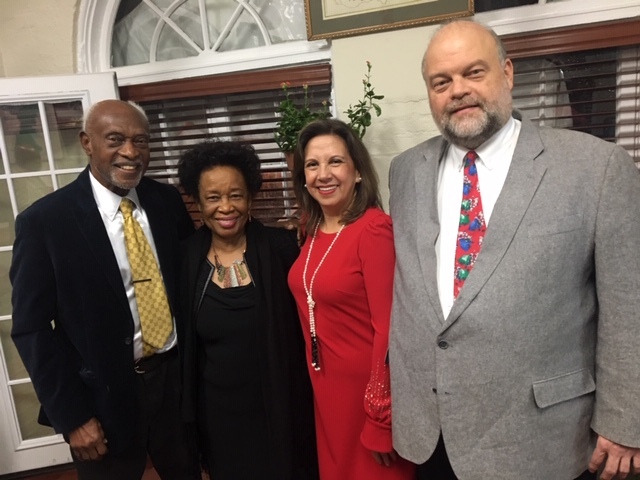 Mr. and Mrs Farrier with American Ambassador Perry Holloway and Mrs Holloway. American Ambassador Perry Holloway and his wife with Zena Stoll.